The Department of Obstetrics, Gynecology & Women's Health offers three sub-specialty fellowships. Our three-year program offers training in the complete evaluation and treatment for couples with infertility, as well as therapy for hormonal disorders that cause menstrual irregularity, unusual hair growth, altered sexual development, recurrent miscarriages, and menopausal problems. Trainees learn operative endoscopy, laser surgery, and microsurgery. Our on-site laboratory provides fellows with experience in prenatal genetic and chromosomal screening. Laboratories in the Center for Translational Research provide bench research opportunities mentored by our research scientists and physicians. The three-year fully accredited ACGME fellowship trains physicians to treat patients with dysfunctions of the urinary tract and the pelvic floor, including incontinence and prolapse. Surgical education includes a balance of vaginal and open, laparoscopic, and robotic techniques. Unique opportunities include a laparoscopic dry lab dedicated to the fellowship, a fresh tissue cadaver lab with full laparoscopic set-up, and collaborative research opportunities with University of Louisville clinicians and basic scientists. 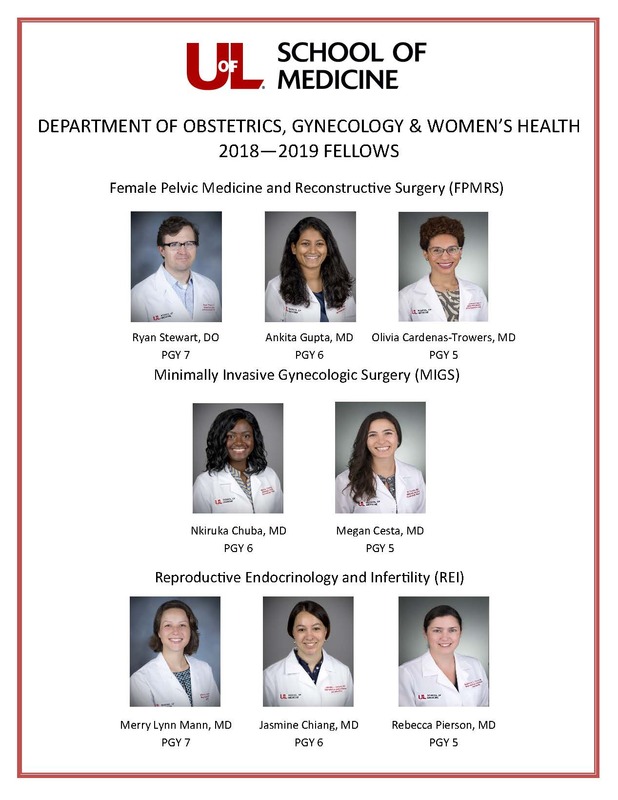 Our two-year fellowship in minimally invasive gynecologic surgery trains fellows in robotics, advanced laparoscopy, and operative hysteroscopy. We serve as a regional and national referral center for the treatment of fibroids, abnormal uterine bleeding, endometriosis, pelvic pain, and ovarian abnormalities, which provide exceptional surgical experience for trainees.